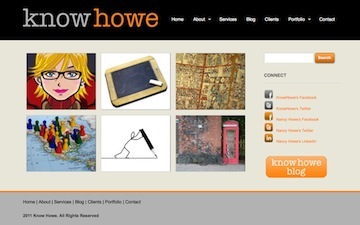 KnowHowe is a full-service writing company that offers a varied menu… from blogs, to press releases, to editing… and everything in between! Plus, you have the added benefit of choosing if you want to use us as ghost writers or as hired writers with bylines. See the tab “Services” for a full menu and please ask if something you need is not on the list! Nancy has spent the vast majority of her life in Pinellas County and began her publishing career at the St. Petersburg Times while attending USF, majoring in archaeology. She moved on to become the Managing Editor of Art & Design News (an international graphic arts magazine), and then to Maddux Business Report 22 years ago – starting out as circulation director, moving to associate publisher and then publisher for the past 12 years and publisher of Maddux NewsWire for the past two years. At the Maddux Business Report she was involved in all of the Tampa Bay Economic Development Organizations as well as the major ones across the high tech corridor. Nancy continues to sit on the boards of some of these organizations. When the Maddux Business Report closed in June of 2010, Nancy continued on as publisher of the daily NewsWire and founded KnowHowe. It was the ideal transition based on her background of writing, editing and publishing. On a personal front, Nancy was one of the founding officers of the Tampa Bay Fossil Club (sponsored by MOSI and USF) and has received awards for paleontology discoveries; for writing and producing a nationally recognized monthly fossil newsletter; and for publishing various archeology and paleontology books.